When you get new software, it is typical that you go through a set-up process whereby you enter in your name, address or any requested information. 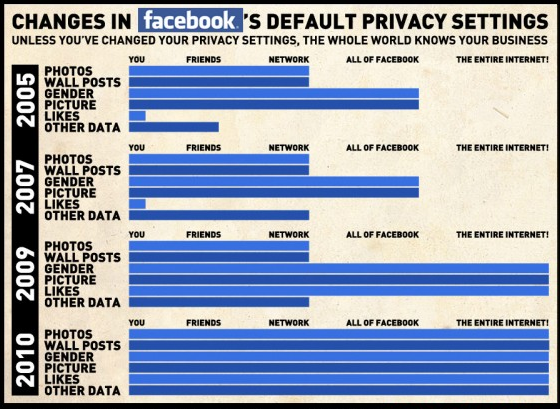 Included in this set-up could (or should) be your privacy settings. Once complete, you are ready to go and are unlikely to return to these screens. Herein lies the problem. Most social networks want you to share as much as possible which means the defaults are to make everything public. This also means that when a policy is updated, you will now be sharing more than you expect to until you actively log in and change your settings. 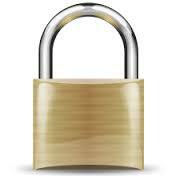 Anyone who has decided to set-and-forget their settings is at risk of having all of their info be seen by the public. 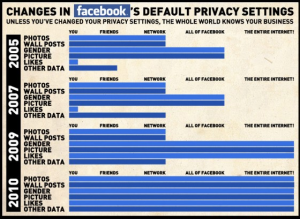 Below is an infographic of the Facebook security changes over the course of 5 years that illustrates which data is public by default at each policy change. Note that by the end of 2010, all of a user’s data was entirely public by default. In a time where smartphones do nearly as much as computers, it is not surprising that so many people use them to connect to social networks. In 2013, there are 189 MIllion people on Facebook who have never logged in from a computer, only their mobile device (a 7% increase from last year). Though most devices will allow you to access the full compliment of settings via their website, older mobile versions of Facebook and Twitter do not. You should sign in online at least once to make sure you have set everything as you would like. Also, some older versions of Facebook software (I have seen this on a Playbook as one example) do not show the intended audience of other people’s posts which means you do not know if your ‘Like’ or comment on that post is public or just for your friend. If you change one Facebook status update to a different audience, your default also changes to that audience. So if you decide to make one public declaration for a charity event by selecting the audience within that status, suddenly your personal setting is changed too and all of your following posts will be public, without warning. You need to change the default back within the settings page. 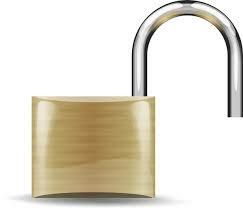 Though public by default, you can be a private user with approved followers. This said, If a private user ‘Like’s a photo that a public user uploaded, their ‘Like’ will be visible and their username will be click-able below that public user’s photo. It used to be that a follower could only send you a direct message if you followed them back. By default now any follower can send you a direct message. To turn this off, there is an ‘opt-in’ check box in account settings that you can uncheck. Your best defence against changing settings? Keep your eyes open. Networks are required to notify users before they make these changes, but the onus is still on you to go back in to your settings to reset them once the changes are applied. And remember kids, stay safe and have fun.